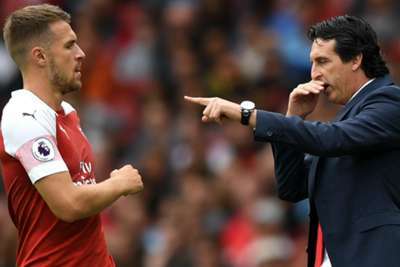 Unai Emery dodged questions about Aaron Ramsey's Arsenal future and did little to reassure the Wales international he is wanted at Emirates Stadium. Ramsey has enjoyed a decade at the club after joining from Cardiff City as a teenager, but he is in the final season of his contract and not thought to be close to a renewal. The Wales international said this month he thought he had signed a new deal with Arsenal, only for the club to withdraw their offer. The Gunners now stand to lose Ramsey on a free transfer if they fail to tie him down to fresh terms or sell him in January. When asked about the possibility of Ramsey departing when the transfer window opens, Emery said: "For me January is very far [away]. "I'm thinking about Monday's match first. I want every player to stay OK, with the mentality to prepare, to play and [be] together to win." Emery was no more conclusive when asked if Ramsey could yet end up staying with the Gunners. He added: "It's the same, my answer. My focus is on every match; the football. The future is tomorrow. "My reason, I explain to every player and to you also, I want the mentality for the next match. Individual things are not for me to speak about now." The former Sevilla and Paris Saint-Germain coach did at least suggest Ramsey is not entirely out of his plans. "I want his performance like the other players," Emery said. "For example, in the last match he started on the bench, then he played 25 minutes with this performance. "On Monday [against Leicester City] it's the same if he starts in the first XI or on the bench, to come with the focus for this match to help us. It's not different [than it is] for other players." While Sokratis Papastathopoulos is unlikely to feature against Leicester due to a "small injury" Emery allayed fears over Pierre-Emerick Aubameyang's fitness. "He didn't play the last match [for Gabon]," the coach said. "He's training with us like the other players who are working here. "He played 45 minutes against the under-23s for us today [Thursday]. I think it's good when he's thinking also to play one match with the national team and then rest to stay better with us."